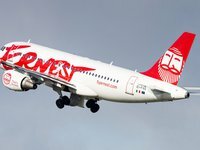 Ernest Airlines (Italy) on March 21, 2019 plans to start operating regular flights from Kharkiv International Airport to Rome and Milan, the airport's press service has reported. Departure from Kharkiv will be three times a week on Thursdays, Fridays, and Sundays. The price of a one way ticket will start from EUR45, including hand luggage and taxes. As reported, in September 2018 passenger traffic in Kharkiv airport was 88,900 people, which is 12% more than in the same period of 2017. In 2017 Kharkiv airport increased passenger traffic to 806,100 people (in 2016 the figure was 599,700 people.) In 2018 it is planned to raise it by another 12% (to 900,000 people). In July 2018, passenger traffic amounted to 104,500 people, which is 20% more than in the same period of 2017 (87,200). Kharkiv Airport has a runway with a length of 2,500 meters and a width of 50 meters. It has two passenger terminals with a capacity of 100 and 650 people per hour.